What truly makes us different is that we offer an all around experience, not just cleaning. We use only the finest name brand solutions specifically selected for your situation. We rinse your carpet with softened & filtered water and pioneered the concept of CHEMICAL-FREE RINSING and are dedicated to the reduction of all chemical residues in the cleaning processes. We offer a complete line of quality services including effective and safe deodorization, complete fabric and carpet protection, uniquely effective ceramic tile cleaning, fine furniture, car interior, and other fine surface cleaning including fine leather. We service clients for many local interior designers, carpet retailers, and furniture dealers. We also offer the Best guarantee in the business. We are dedicated to building a long term relationship for all of your floor & upholstery cleaning needs. YOUR ABSOLUTE SATISFACTION IS OUR GOAL! You may know that in ANY cleaning situation, there are only 3 basic variables: MAN, MACHINE, AND CHEMISTRY! 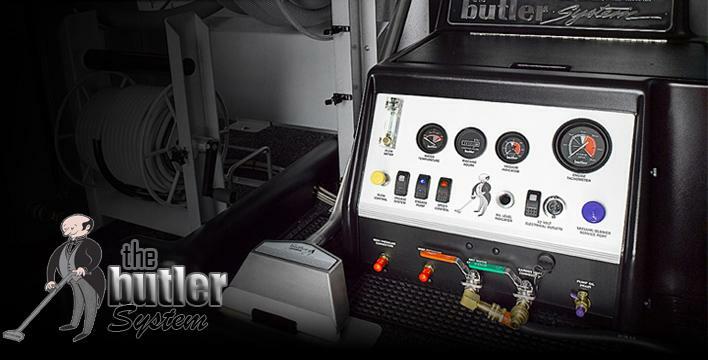 We use one of the most potent and reliable machines sold within the cleaning industry, THE BUTLER SYSTEM, which is TRUCK POWERED for a level of Deep extraction and Fast drying that is completely unique! We are certified by the I.I.C.R.C. with more than 40 years of experience, and have been an insured business established in the Tampa Bay Area for well over 20 years! If you've NEVER experienced our unique cleaning services before, you can get up to 100 square feet cleaned FREE! NO CATCH - NO CHARGE - NO OBLIGATION! Must be new client, must own home if residential or be responsible party if commercial, and must be present at time of service. Limit one offer per client. For demonstrative purposes only. Most processes completed with The Butler System, the industries best Truck Powered Cleaning System!